It is a tradition for the daughters in our home to have their first date with Daddy just before they start kindergarten. They go out alone for dinner and then go shopping to purchase school supplies. Karissa has looked for and longed for and planned for this event for weeks on end. She had her dress and hair style and "fancy" restaurant picked out far in advance. "Daddy...when is our date?!" became a daily household question. Finally, the big day arrived. 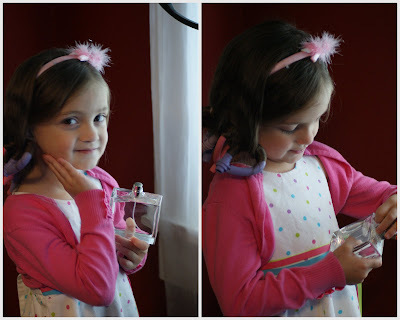 Karissa was primped and pressed and curled and perfumed (even got to wear mommy's special perfume!). A very special girl....a very special evening. They were off with lots of excitement. She had chosen Cracker Barrel very early on in the date planning process. One of the benefits of starting "Daddy dates" very young......you can share a meal! I think they shared a chicken and dumplings meal (with mac & cheese, of course). 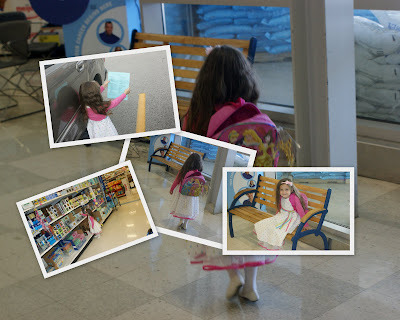 Then, armed with their handy-dandy school supplies list they took to shopping. Then they went to a "fancy" restaurant for dessert. 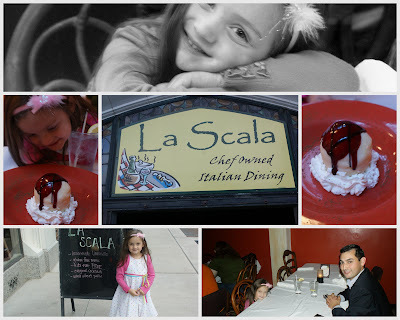 They went to La Scala's - a cozy Italian restaurant downtown Lafayette. They shared a dessert David loves....citrus sorbet with a white chocolate shell and drizzled with raspberry. It is tiny, but exquisite. She didn't know Daddy got this shot on the way home until we looked at the pictures together later. She was happy and worn out. The girls and I are so blessed to have a daddy/husband who - as busy as he is - takes time to take us out on dates. I don't take that for granted. We love that man. Here's to many happy daddy dates to come........! Oh, this is just too cute! My girls love the daddy dates too, but it's been way too long. Thanks for the reminder to schedule it again soon! How sweet! Not long ago Kassady had her first date with Daddy. It was so sweet and special!! !